Osteoarthritis: Also known as 'wear and tear' arthritis, this is caused due to the degradation of cartilage inside the associated hip joint. This results in the bones being rubbed against each other, causing their wear and tear. Hip Fracture: A severe hip damage resulting from an accident will necessitate the surgery. Rheumatoid Arthritis: This is caused due to the misdirected action of immune system on the joint lining. This can also lead to hip damage. For Correcting Hip Dysplasia: Dysplasia refers to abnormal growth of hip bones. This might be essential for younger individuals are affected with such a kind of disorder. Most hip replacement surgeries are done to individuals who are much older (60-80). Older people are mostly susceptible to bone damages. As they become older, the strength of the bone will decrease and this may cause bone injuries and fractures. It makes them to get the bone replaced. 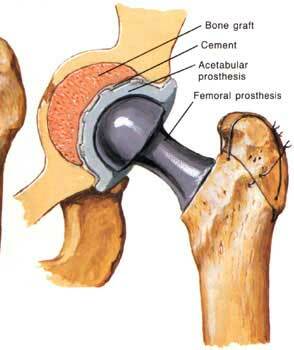 Young individuals may also undergo for hip replacement surgeries in certain cases. When they are affected with dysplasia (abnormal growth of hip bones), it is essential to have a hip replacement surgery. The procedure begins with giving general anesthesia (in most cases) followed by making an incision of suitable size on the hip. Incision can be of several types like posterior, lateral, anterior and antero-lateral. Through this incision, the original hip joint is removed and immediately replaced with an artificial one. This hip prosthesis is mostly fabricated from an alloy of different metals mostly stainless steel. A polyethylene acetabular cup and a ceramic head provide adequate support. The amount of time taken for such a surgery is almost 60-90 minutes. Cent percent recovery can be achieved in about 3-6 months. All these are applicable in the case of joint replacement also.